This maxi dress is becoming less maxi every day, everytime I wear it, it's becoming shorter and shorter. At the rate this baby bump is going soon it will be knee length. Not much else makes you feel as pregnant than wearing one large flowing piece of material without a whole lot of shape. But. I like it anyway, it's just so easy, no pulling tops down that are getting too short or pulling ill fitting pants up every 5 mins. I love the print on this dress too!! I bought it a little bit ago when Esther clothing had 40% off their whole website. But browsing their website makes me wish I could wear all of their clothes now!! I am wearing thongs (flip flops) again like I pretty much do everyday at the moment because my feet look a little like mini pillows. I think it is partially due to the heat, but they are puffy and most of my shoes don't really fit, especially in the afternoons. Last pregnancy my feet grew a half a size, I hope that doesn't happen again. It's still in the mid 30's (celsius) here in Perth, which is weird for April, but we've been trying to take advantage of it and getting some beach days in. In other news, it's my 30th Birthday this week. Goodbye 20's! I feel like I haven't had much time to think about it, it has sort of snuck up on me. I can't even tell Joel what I want for my birthday, I think some Internet browsing tonight is in order. My little helper wanted to pose with his Pop's sunnies as well!! I'm linking up with Jess at ESSENTIALLY JESS for #IBOT today!! 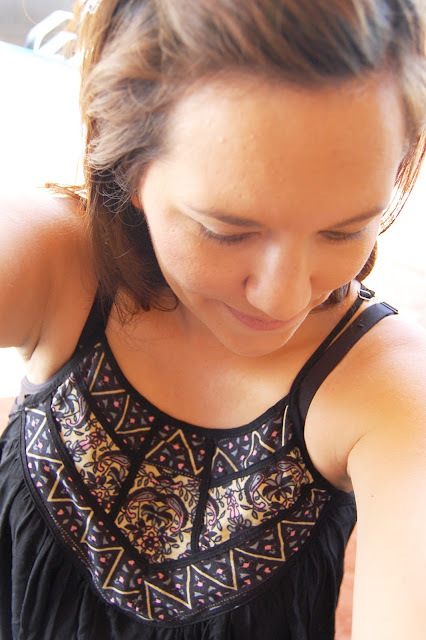 Head over and check out some other great Bloggers!! 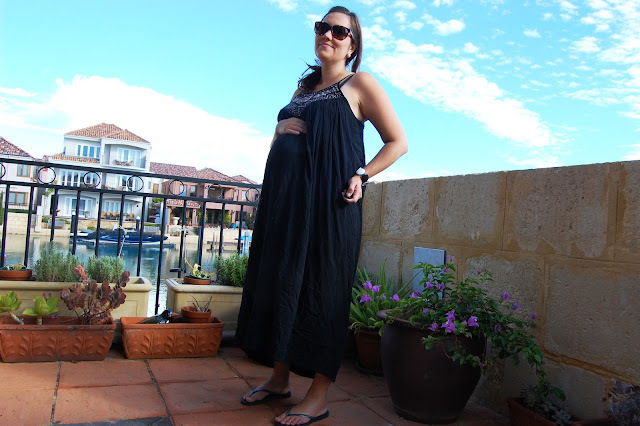 17 comments on "Maternity Style: 28 weeks Maxi Dress "
You are looking gorgeous! Glowing! Love the dress and happy 30th!!! How glamourous do you look in that first photo! 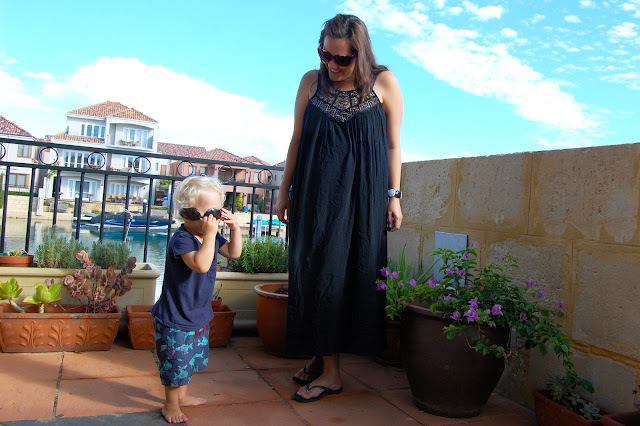 After my pregnancy I had to take a big break from maxi dresses...I was just so sick of them! Beautiful! That is a lovely dress :) I am a big fan of the maxi. Happy Birthday! I had a maxi dress I wore a lot towards the end of my pregnancy. So comfy and non restricting. Have a great birthday week! Make sure you look after your heels if you are wearing thongs a lot, I had a full pedi when I was pregnant, was amazing(hint, hint, for your birthday). Happy Birthday! You are glowing and look gorgeous. The dress does look super comfy and has room for growing bump. You're looking so gorgeous Karen! Love that dress! Maxi dresses are such a good easy pregnancy option!! I have been wearing mine a lot, but not so practical for breastfeeding! I just tried to leave a comment on your blog, but because of the captcha confirmation it seems to run out of room and has nowhere for me to enter the captcha letters. Weird. Anyway, wanted to say that those Chevron sheets are awesome!! I need them!! My feet went up a while size while pregnant with Punky and they haven't gone back! Seriously hoping it doesn't happen again this time. My feet haven't started to swell yet and I'm hoping they aren't as bad this time as I've heard sometimes if it was bad for the first it's not as bad second time around.